My neighborhood is overflowing with amazing, cheap food. It's gotten to the point where I hardly ever eat at home, unless it's to make myself eggs and toast in the morning. How could I resist the temptation of burgers from Pearl's Deluxe? Ramen from Katana-ya? Pho from Turtle Tower? Indian food from Shalimar? The truth is that I don't resist. Sometimes I look at my kitchen and feel a twinge of guilt but mostly I just look forward to the next time I get to stuff my face with delicious food. On this particular day I went on an epic walk around San Francisco with my brother, starting at Turtle Tower with two huge bowls of pho, stopping at a hole-in-the-wall bakery in Chinatown for dessert, and then on to North Beach for coffee. 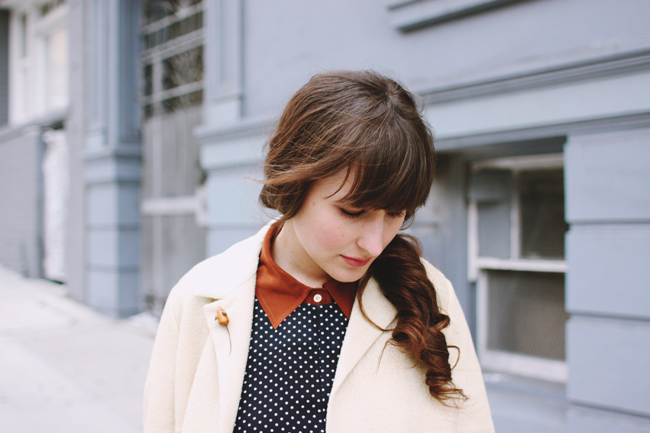 I wore my trusty navy blue polka dot dress that I usually throw on when I can't be bothered to think too much about my outfit (I wear it probably more than any other) and a newly acquired coat ($10 at the flea market!) and sweetly coerced my brother in taking Outfit Photos. This involved a minor bit of instruction ("Um, could you squat down a bit when you take them?") and lots of laughing. My brother thinks I'm a giant dork and he is right. Love that white coat. It's beautiful. That coat is lovely. What a great find! That coat is gorgeous! I love the dress too. Yum, I'm envious of all your cheap restaurants, I love eating out too. 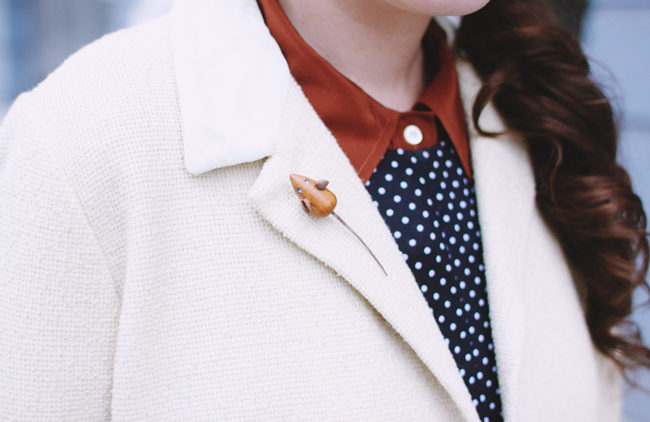 I have the same teak mouse pin, it was my first ever vintage purchase when I was 8 years old! I'm digging the side ponytail look too, your hair always looks so pretty. Everything is perfect here but that pin...omg, love it!! this post made me really happy... sounds like such a fun time! Wow!! Simply stunning! These pictures are pretty much perfect! And so is your outfit on you!! haha your brother must be a sweetie! that sounds just like when I ask my hubs to take pics. You look darling- that dress is great & love the little tie & how you wore the yellow blouse under. I usually think flats makes an outfit look casual, but you really changed my mind about it here! 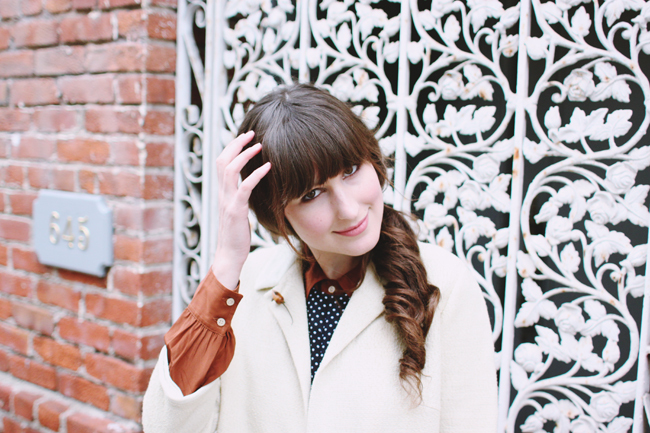 Cute, chic and classy outfit! I love your outfit. Too cute! And I can't believe your jacket was only ten dollars! One of the best bargains I've seen.